To say that heavy metal aren't intelligent or thoughtful in their conceptual process belittles the many bands that invoke everything from philosophical to fantastical ideas, or sometimes, in the case of Germany's Freedom Call, historical circumstances. For their latest offering, Legend of the Shadowking, Freedom Call attempts to tell the tale of the eccentric and quizzical King Ludwig II, also known as the Swan King, Fairy Tale King, or simply "Mad" King Ludwig. Ludwig is most known for his disregard for politics and contemporary affairs, appreciation of the arts and supporter of the composer Richard Wagner, building lavish fantasy castles, and also driving his nation into financial ruin. Obviously quite the character, this makes for good storytelling. But does it make for good power metal? I'm not sure. Without doubt, Freedom Call is up to speed on Legend of the Shadowking. Musically, they are in the best form. The work is enormous, even ambitious, with 14 tracks of rollicking power metal. However, I felt the concept, the story, distracted me away from the music. Actually, as impressive as their talent is in creating genuine impressive German power metal, most everything on Legend of the Shadowking became as massive blur. That's not to say that some songs were brilliant. Hardly. Resurrection Day and Thunder God are magnificent and quintessential power metal pieces. And the wonderful Under the Spell of the Moon shows that power metal isn't all about a galloping pace, but also sound melodic composition. Unfortunately, you have dig deep and listen long to find the gems on Legend of the Shadowking. Frankly, I don't want to work that hard to enjoy my heavy metal. 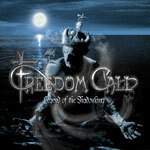 Nevertheless, on Legend of the Shadowking Freedom Call is at the top of their game, showing their caliber as one the great current power metal bands. I'm not sure this album is representative of their best work. Prepare to give Legend of the Shadowking repeated listens, if you give it first. On Legend of the Shadowking Freedom Call is at the top of their game, showing their caliber as one the great current power metal bands. I'm not sure this album is representative of their best work. Prepare to give Legend of the Shadowking repeated listens, if you give it first.